"Photographic negatives left a century ago in Captain Scott's last expedition base at Cape Evans have been discovered and conserved by New Zealand's Antarctic Heritage Trust. The negatives were found in expedition photographer Herbert Ponting's darkroom and have been painstakingly conserved revealing never before seen Antarctic images. The Trust's conservation specialists discovered the clumped together cellulose nitrate negatives in a small box as part of the Ross Sea Heritage Restoration Project which has seen more than 10,000 objects conserved at Scott's Cape Evans hut. The negatives were removed from Antarctica by the Trust earlier this year. Detailed conservation treatment back in New Zealand separating the negatives has revealed twenty-two images. The photographs are from Ernest Shackleton's 1914-1917 Ross Sea Party, which spent time living in Scott's hut after being stranded on Ross Island when their ship blew out to sea. 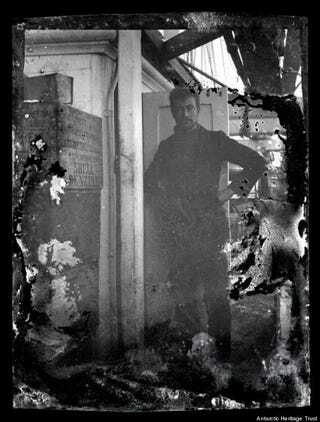 One of the most striking images is of Ross Sea Party member Alexander Stevens, Shackleton's Chief Scientist, standing on-board the Aurora." Their servers appear to be slammed right now as well.